Look for these banners on 300 S. in Salt Lake City throughout May. May is Utah Bike Month! In 1956, Bike Month was created nationally. In Utah, in 2015, Governor Gary Herbert has declared May to be Bike Month. May is a month of great weather and is great time to take part in any number of bike activities. This year, there are over 30 events in Utah so far. It’s a great month to celebrate the bicycle, and to celebrate on the bike. Grab a friend, especially one who doesn’t usually ride, and bring them to one of the many great events across the state! The National Bike Challenge starts on May 1. Keep track of your miles and help create a movement. Sign up free at nationalbikechallenge.org. May 6 is National Bike to School Day for kids, college students, and everyone else in academics! On May 10, Cyclofemme rides, a set of low key rides for women only, will be taking place in several locations around the state including Salt Lake City and Provo. May 11-15 is Bike to Work Week. Many communities around the state will have Bike to Work days too, some during this week, and some on other days during May. 2015 Salt Lake City Pit Stop Locations. Stop in for free breakfast! National Bike to Work day is May 15. Replace casual Friday with bike Friday. 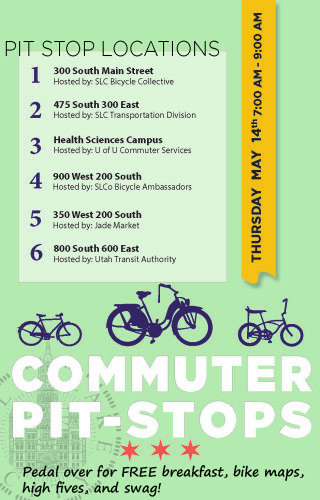 May 15 is also the date for the UTA Bike Bonanza. This long running celebration of the bike happens from 4-8 pm at the Gallivan Center in Salt Lake City. There will be booths and events for kids and adults. Provo is also hosting a Bike Prom on May 15. Get your bike, your best suit and dress (that you would wear on a bike), and come on out. On May 20, 2015, honor cyclists who have been hit, injured, or killed while riding. The Ride of Silence is a slow paced processional ride that will be held in Salt Lake City and Provo in the early evening. On May 30, close out the month by attending Bike Prom, a prom on bikes! It’s a fundraiser for the Bicycle Collective, and a night filled with a bike ride, dancing, and a huge party. Governor Herbert has declared May as Bike Month in Utah. 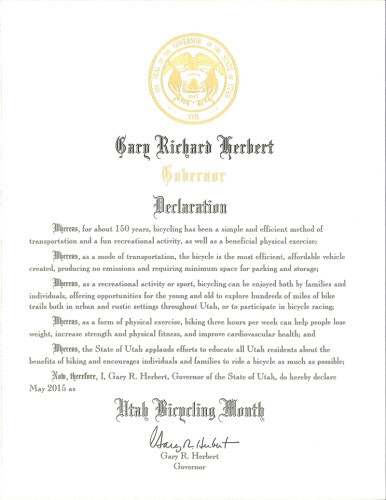 Governor Gary Herbert has declared May 2015 as Bike Month. 2 Responses to "May is 2015 Utah Bike Month! Ride Your Bike and Celebrate!"